Each time something arises from Chavez on the news -hence the net-, its foreign supporters always argue: He was elected. Well, as Venezuelan and therefore user of that electoral system, allow me to elaborate about that system. In 1998 Chavez was elected with 3 million votes, out of a population of 11 millions voters (Venezuela population is around 23 million people). After that election his internal popularity has gone -and hasn’t stopped- downhill. The heads (bosses) of the National Electoral Council (CNE, Spanish initials) were appointed by him. They were appointed because they were loyal to the revolution. While today’s faces has been changed by Chavez, their objective remains the same: be loyal to the revolution. 3 Out of 5 of those chairman’s are loyal to the revolution. How? -> Use computers to vote. These are Casino machines, have you ever seen a Casino lose? These e-voting machines register the votes and at the end of the voting day, send the info to a central server (controlled by the CNE) and then the CNE will tell the people who won. In case you’re wondering, no one is allowed to be or enter in the central room of the CNE -aside from governments representatives-, were these votes come together. Guess who won at that time? No auditing of the votes were allowed at that time. Just for the sake of argument, Venezuelans did vote whith a machine before these computers (before the Chavez machinery), however the voter marked (with a pen) his/her votes, then the machines read it. 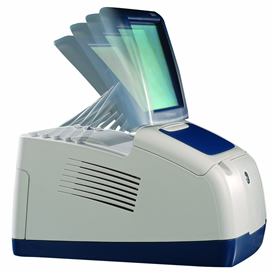 In the end, the votes were counted manually and only after that they were checked against what the machine had. If they were the same number of votes, then the machine was allowed to transmit that info to the central server room, in which the votes will be communicated to the people. Such a auditing method its not possible today. At least not that transparently. Time pass by and the methods has been refined. Specifically the Chavez machinery has applied the oldest trick on the book: One person can vote several times. Since the CNE is the one controlling the voters registry, and at the same time the government controls the identity system (cedula), well … Several people have several identities in the electoral vote registry, allowing them to vote several times. As if it was not enough, auditing was allowed, but only the centers the CNE (hence the government) approved. So let me explain this: Those centers which will be audited, are previously known by the CNE. Obviously allowing them to gear the votes to their convenience. And no, random auditing of the centers its not allowed. The only time this electoral machine failed was because it was not put to work, since the government relaxed themselves thinking they were going to win anyway: December of 2007. After this bug in the electoral system, the machinery (The Matrix) has never went off guard again. Now do you understand why and how Chavez has won several times?